This study investigates the traditional and local knowledge of Bedouin (Badu) communities in the Badia region of the Hashemite Kingdom of Jordan with regard to livestock production, medicinal plant use and rangeland management, and examines how such knowledge has changed over time. Badu customs and practices from the last 50 years are compared with current realities in order to get a clear picture of how modernization, social change and environmental factors have negatively affected the land, the people, livestock and plant biodiversity in the Badia. The findings indicate that the rangeland environment has become severely degraded, herd sizes have decreased, plant species are in danger, and traditional Bedouin lifestyles have changed radically, due to unrelenting pressure on the land, water scarcity, manufactured livestock feed, government intervention, artificial borders, and the abandonment of natural water harvesting and hima practices. In an attempt to better understand and document local knowledge about livestock, rangeland management and medicinal plant use in the Badia region of Jordan, the Royal Botanic Garden (RBG) conducted a study on the accumulated wisdom of older generations of Jordanian Badu. Despite the harsh environment of the Jordan Badia, the fragile ecosystem has until recently provided local people with precious services, such as desert plants of high medicinal value. The Badia has also traditionally made two vital contributions to the life and economy of the entire Kingdom, namely forage and water sources. The Badia rangelands used to generate a significant portion of domestically produced forage for the range livestock industry, providing sufficient natural forage for around 800,000 sheep for a whole year (Badia Research and Development Centre BRDC, Meteorological Department Data ). However, given the current degraded condition of the rangelands, that figure now appears overly optimistic. Already in 1991, estimated forage yields in the Badia had declined to less than 10 % of the rangeland’s potential as compared to earlier estimates of 70 to 80 % (FAO ). The rangelands also serve as watersheds that receive rainfall, yield surface water, and replenish the groundwater throughout the region to the east and south of the western Jordan highlands. In fact, they are an essential part of Jordan’s national water conservation strategy. Unfortunately, however, overexploitation of the land, and other negative factors in recent decades, has had a serious impact on the Badia and its people. One way of helping the Badu and the Jordanian government understand the current problems and chart a practical course for the future, is to study and document traditional knowledge (TK) in Jordan's Badia. Valuable and practical knowledge from the past may provide insights that can lead to solutions. This is especially important now, as the recent generations are abandoning and forgetting the old ways of their forefathers. Preserving the wisdom accrued over centuries of practice can serve as the foundation for promoting crucial health and economic components, conserving biodiversity, and preserving the Badu culture and inheritance. ‘Badia’ is an Arabic word commonly used to describe the arid to semi-arid regions of the Middle East where the average rainfall is less than 200 mm annually (Bailey et al. ; Al Tabini et al. 2008; Al Tabini 2001). 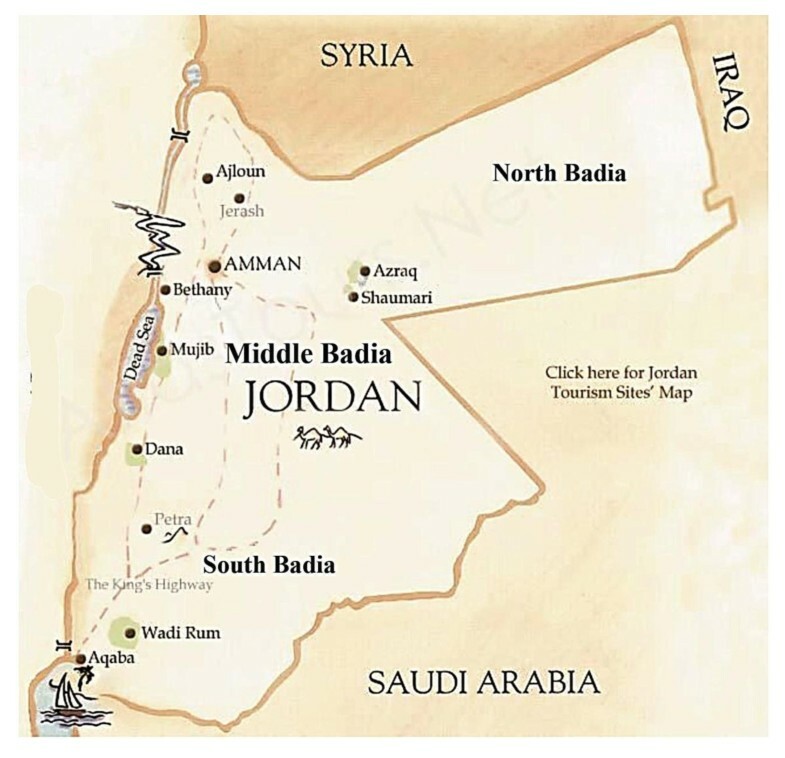 Badia constitutes a large proportion of the countries in the region: around 80 % of Jordan, 75 % of Iraq, 90 % of Saudi Arabia and 55 % of Syria (Alwelaie ; Sankari ). The badia consists of two major areas, the steppe and the desert, which have been classified according to their rainfall and vegetation cover. The steppe is the main area that can provide good vegetation for animal grazing, and usually receives an average annual rainfall between 100 mm and 200 mm, whereas the desert receives less than 100 mm of rain annually and has limited grazing resources. 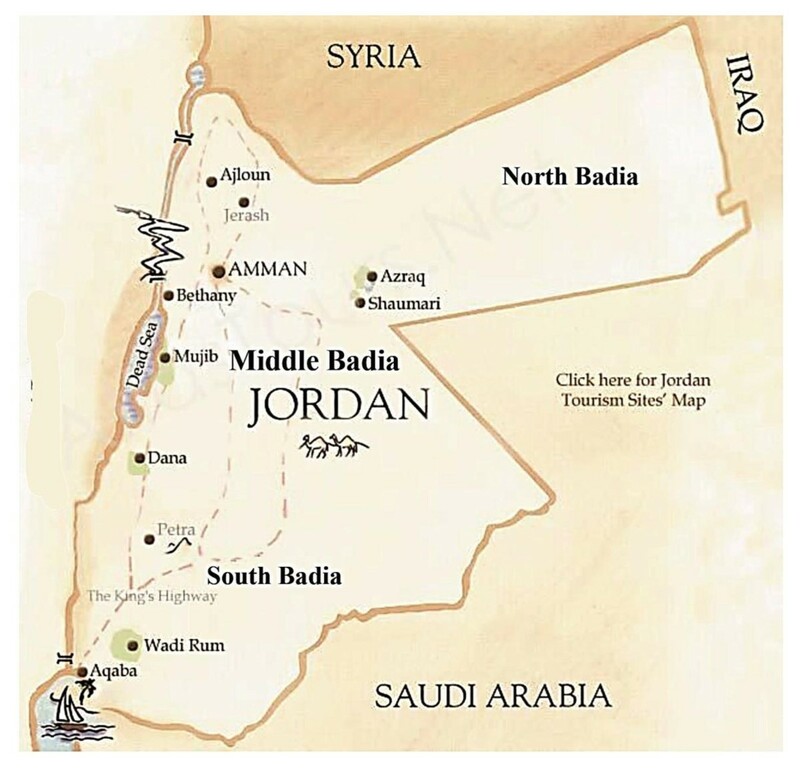 In Jordan, the badia is divided into three areas: northern Badia, southern Badia and middle Badia (Figure 1). Historically, the area’s inhabitants, known as the Badu or Bedouin, lived in a nomadic fashion, but those who remain are now only semi-nomadic at most. The Hashemite Kingdom of Jordan currently stands at a crossroad in arid land management. The traditional pastoralism of the Bedouin has essentially broken down (Al-Sirhan ; Campbell and Roe ), but has not been replaced by an effective management system. During the 1800 s, the Ottoman Turks began a policy of ‘sedentarisation’ of the region’s nomads, encouraging them to settle in villages. With the creation of the modern states of Jordan, Syria, Iraq and Saudi Arabia from 1923 to 1948, the countries’ leaders sought to protect the sovereignty of their borders in part by limiting movements of the Bedouins and asking them to declare their loyalty to whichever state was their principal residence. Nevertheless, nomads regularly migrated in and out of Jordan across the Syrian, Iraqi and Saudi Arabian borders into the 1980s. The study began in April 2010 with a research team of three experts in particular and complementary fields. A rangeland specialist, an expert in social economy and a veterinarian were chosen, to provide expertise on socioeconomic and veterinary issues and offer insights into animal diseases and changes in diseases affecting livestock over time. What animal species and numbers were raised in the past and currently? What medicinal plants have been used in the past and currently, for the treatment of both humans and animals? What were grazing regimes like in the past and what are they in the present day? Which plants do the Badu consider to be endangered or extinct? What are the differences in animal diseases from past to present? The questions were designed to determine a number of broader implications. Recording the number of livestock over the years, based on the recollections of the Badu, can indicate potential correlations between herd sizes and rangeland deterioration in Jordan. Studies have indicated that the increase in the number of animals in the Badia leads to overgrazing and deterioration of the rangelands (Abu-Zanat et al. ; Al-Tabini ). By tapping into local knowledge, these questions can help researchers understand the changes that have arisen in raising livestock over the last 50 years. Additional questions aimed to understand the extent to which herders relied on grazing in the badia, and how grazing regimes correlate to land degradation and the deterioration of natural resources in the badia. Many Badu have experienced changes in grazing systems in their lifetime, and the researchers were keen to see if the reasons for these changes could provide greater insight into the current state of Jordan’s environment. Generally speaking, the study was able to address participants from the entire badia region, randomly selected as the researchers visited the area. The questionnaire was tested on five separate occasions to determine efficacy before use. Ultimately, the questionnaire consisted of two types of questions. Questions requiring a Yes or No answer provided quantitative data, while open-ended questions allowed for individual analysis. During each questionnaire interview, one member of the research team asked the questions and led the discussion while another took notes. The questionnaire was designed to encourage informal discussion and not restrict the responses that could be provided. All of the 90 participants in the study, 70 men and 20 women, were Badu people who raise livestock or have raised livestock in the past. The participants came from three living styles: nomadic (11 %), semi-nomadic (27 %), and fully settled (62 %). The focus was on older generations, as the holders of traditional knowledge, with almost all of the participants being over 50, and the majority being over 60 years of age. Most participants were chosen at random, but about 10 % were specifically selected based on the recommendation of others for their expertise. Occasionally, the research team was directed to one person in particular because of his or her noted knowledge on the topic. At times, women would respond to questions as well. Some men would ask their wives to respond to the questionnaire, particularly when it came to medicinal plants. By observation, we found the women tended to give more detailed information on medicinal herbs and their use in treating people, while the men were more focused on animal diseases and other issues related to herding and rangeland use. While completing the questionnaire, the participants were encouraged to respond freely. In the event that they strayed from the topic at hand, the researchers would attempt to bring them back to the point. When a participant mentioned something new or unusual, the information was brought up in later sessions with other interviewees. This was done in an effort to confirm or reject the knowledge in question, in order to ensure credibility. During the fieldwork, the researchers visited villages in and around the badia at large. At times, the researchers would stay overnight to take further notes. Fifty years ago, the people of the badia region of Jordan were in large part nomadic, living in tents (bayt ash-sha’r) and moving from place to place with their herds. Today, however, the majority of Badu are either semi-nomadic, staying in villages in winter but moving to grazing areas with their herds in spring and summer, or sedentary, living year-round in villages and keeping small herds. In addition to the change from nomadic to semi-nomadic and settled status, our demographic research recorded current grazing locations, education levels, age, and family size. All of the participants reside within Jordan, 71 % in the northern Badia and 29 % in the middle and southern Badia. The mean family size for this random sample population was 8.45 persons. By contrast, according to the Department of Statistics (DOS) census of 2007, the family size for the Badu was 5.6 persons, while the average for the country as a whole was 5.3 persons (Department of Statistics ). The larger family size in our sample is due to the fact that we often counted several generations living in the same household, while the DOS figures are based on individual family units. The 2007 census found 379,734 Badu, spread throughout 83.3 % of Jordan. This is the first real demographic data for the Badu, since the government was earlier unable to make an accurate count due to their mobility, especially when they migrated outside of the country (Department of Statistics ). When using local knowledge as a tool for research, especially in the case of past grazing habits, it is vital to interview individuals with experience in the field. The majority of those interviewed were elderly. Eighty-five percent of the participants were either illiterate or had completed only primary school, as schooling in the past was difficult due to constant migration.c Fifty-four percent of the participants were between 50 and 70 years old, and 39 % were over 70. With all of the Badu now residing permanently in Jordan, 71 % raise their livestock in the northern Badia region, with 56 % in the northeastern Badia and 15 % in the northwestern Badia. Modern-day political borders no longer allow the Badu to cross over into other countries and, as a result, Jordan’s limited rangeland resources now rarely have a chance to regenerate. The change to a non-migratory grazing regime has put stress on the land where the Badu now keep their livestock year-round. According to our findings, 50 years ago the mean size of a sheep herd in the badia was 155 head whereas the current mean is significantly lower at just 109 head. We had expected to find that today’s herd sizes would be much bigger now than 50 years ago, especially since sheep flocks in the badia were as large as 250 head prior to 1996 (Campbell and Roe ). The current small flock sizes in Jordan’s badia are a consequence of several historical and social factors. To understand what happened and why herders now have so few sheep, it is important to examine how Jordan’s natural forage and rangeland resources became depleted, and what role government feed subsidies played in that process. In the past, when the nomadic Badu moved from one area to another, the natural resources of the land sufficed to feed the flocks. However, as the Badu began to settle and stay in specific areas, due to border restrictions, sheep grazed constantly in the same places, immediately destroying new plant growth, until the land remained bare and became no longer able to sustain livestock (Al-Sirhan ; Huss ; Moore and Bhadresa ). As a result, the government began selling manufactured livestock feed to the Badu. At first, the trucked-in feed was affordable for the Badu. But when prices rose, the Jordanian government introduced a subsidy on livestock feed in the 1980s. Unfortunately, the subsidy only exacerbated rangeland deterioration, as the availability of cheap feed encouraged the flock owners to keep large numbers of sheep (Hatough et al. ; Al-Eisawi and Hatough ; Hatough-Bouran and Disi [1991, 1995]), whose presence continued to prevent rangeland plant regeneration. In 1996, however, the Jordanian government abruptly stopped the subsidy on livestock feed, causing the price of manufactured feed to jump from approximately USD 85 to USD 130 per ton, and eventually to the current price of around USD 250. It suddenly became far more expensive to feed sheep. Since livestock owners were by then almost totally dependent on manufactured feed – the badia rangeland being so severely depleted and unable to supply much forage – they were forced to sell off some of their sheep in order to afford to feed the rest. From that point on, sheep flocks began decreasing significantly in size. With no other alternative, whenever more feed was needed, herders generally had to sell even more animals to pay for their purchases. Flock sizes today are far lower than prior to 1996, as more and more sheep herders have had to sell off most, if not all, of their flock in order to sustain a small portion of their animals and provide a livelihood for their families. In 1996 Rowe found that the average production cost/sheep/year was 48.49 Jordanian dinars (JOD) (USD 68).The profit margin dropped from 13.5 JOD (USD 19.07) per head to 1.62 JOD (USD 2.29) per head, an 88 % decline in income (Oakley ). In the face of this crushing economic blow, many families abandoned their livestock altogether (Al-Oun ; Rowe [1998a]a, Rowe [1998b]). Because livestock husbandry is a family business, family incomes declined and many young people, who normally would have been employed in the family business, were forced to look elsewhere for work. This had debilitating effects on family social structures, as well as family income. Recently, however, Abuamoud et al. () found, in a case study on local herders conducted by the Royal Botanic Garden, that the cost per head had risen to 60 JOD (USD 80) and the herders were making no profit, but in fact had a net loss per head of 15 JOD (USD 22). These figures make it very clear that the Badu are suffering and losing their main income source. Goats in the badia are also declining. According to the interviewees, the decrease in the number of goats per family, from 14 more than 50 years ago to a current mean of seven, is a result of both household consumption and the same economic and environmental reasons that are causing decreases in sheep numbers. Our study found that camel populations are also decreasing. Raising camels has always formed a significant part of customs and culture in the badia, as the possession of camels is a sign of wealth and a symbol of Bedouin heritage, as well as a traditional and vital method of mobility and transportation. Fifty years ago, participants possessed an average of 14 camels per family. Nowadays, however, participants average less than one camel per family. The change from a purely nomadic to a semi-nomadic or settled lifestyle in the badia negates the need for camels as a means of transportation. Furthermore, modernity, in terms of social change and mobility, has changed the ways in which the Bedouin people see the necessity for camels. The current reliance on motor vehicles is also a major reason for the significant decrease in the Badu’s use and possession of camels. This result is in line with data from the Department of Statistics (DOS). In 2007, the total number of camels in the badia was 6,848 and the number of Badu families was 67,810. Dividing the number of camels by the number of families gives a mean of 0.1 camels per family (Department of Statistics ). Fifty years ago, the badia region contained diverse types of land and fields that provided excellent forage for animal grazing all year round. Back then, 99 % of the participants’ animals grazed on the rangeland, or open pasture. The participants explained that in the past, there was more rainfall (see also Hiernaux ) and they grazed their livestock in completely natural conditions. Barley feed was completely unknown to them. Starting in the late 1960s to early 1970s, concentrated feeds consisting of barley and wheat bran, imported in large part from Syria, became popular, as noted above. The Badu were beginning to accumulate more livestock and thus bought more feed. After a relatively short period of time, however, the great increase in livestock numbers put tremendous pressure on the limited amount of natural forage available. A severe degradation of the rangeland began in the mid-1980s, as discussed below, and caused concentrated feed to increase in price and in demand. At the same time, the herders began demanding higher subsidies to compensate for the almost complete disappearance of natural rangeland areas (IFAD ). In response, the government set a fixed price for feed, to help the Badu feed their livestock and protect them from further cost increases. The decision to introduce a set price unfortunately was detrimental to the rangeland, as it allowed the Badu to maintain flocks much larger than the rangeland could tolerate in terms of grazing capacity. When the Jordanian government decided to change its policy and stop the feed subsidy in 1996, in order to meet World Bank requirements for economic reform, it was a severe financial blow for the herders. Flock sizes were cut back considerably, but the herders still remained dependent on trucked-in feed, as the rangeland has never been able to recover from the constant presence of sheep. By 2011, only 1 % of the study participants were still using the rangeland for grazing, but only for three months of the year. During the remaining 9 months, they provided feed to their herds. The other 99 %, who used to depend solely on the range to feed their flocks 50 years ago, currently maintain their livestock with concentrated feeds throughout the entire year, even though their sheep are physically present on the range. The presence of the sheep prevents the regeneration of the rangeland, because anything that begins to grow is immediately eaten, and the earth remains barren. With any endeavour to raise grazing animals comes the issue of water. This is especially true in the badia where rainfall is minimal and water resources are scarce. In the past, the Badu relied solely on natural forms of water harvesting whether through ponds found throughout the wadis (river beds) or man-made dams. The Badu knew where and how to dig for natural water and created traditional wells based on their observations of soil and valley formations. Substantial water sources also existed in the northern highlands bordering Syria. However, the overuse of water harvesting and the building of dams in southern Syria have resulted in a significant decrease in the flooding of waterways in the northern Jordanian highlands, which is essential for the replenishment of Jordan’s water resources (Brooks ; Abu-Sharar and Battikhi ; Beaumont ; Scott et al. ; Mohsen ). Nowadays, unlike in the past, natural dams in the badia can take up to five years to fill, depending on the amount of water captured during the rainy season. Therefore, the Badu can no longer rely on the northern waterways as a source of water for their livestock. Due to droughts and the uncertainties of the desert environment, the government of Jordan has dug many wells to provide water for livestock and people in the badia. Although 100 % of the participants in our study used natural water harvesting 50 years ago, today 73 % use only government wells. Twenty-six percent now use water harvesting as well as government wells, and only 1 % still rely solely on water harvesting. Although government wells are free and constitute a vital water resource for the Badu, commuting to the wells is difficult and economically draining. In order to sustain their livestock, the Badu have to fill up a tanker truck with water at the closest well on a daily basis, sometimes driving a round trip of up to 60 km. Another aspect of the Badu lifestyle that deteriorated is related to the livestock grazing period. Fifty years ago, the average grazing time was 7.65 hours per day. In contemporary times, grazing time has been reduced to an average of just 25 minutes per day as there is very little natural fodder at the locations on the range where the herds live year-round. The sheep immediately eat any young plants that begin to grow. This significant decrease in grazing time directly correlates with many environmental factors in the badia. Reasons for this change in livestock grazing vary, but all relate to drought, the depletion of plant forage and the degradation of the land. An overwhelming 98 % of participants believe that droughts are a major cause for the dramatic decrease in the average daily grazing time (IFAD ). In the Jordanian badia region, the average rainfall is less than 200 mm per year, with some drier regions receiving less than 50 mm of rainfall annually (Bailey et al. ; Al-Tabini et al. ; Al-Tabini ). There is a perception among the Badu that desertification has been caused, or at least exacerbated, by low rainfall, and is perhaps associated with global warming. Although the data do not reveal any long-term drying trends, there has been a more or less steady decline in rainfall since 1989 (Figure 2). Every year since 1992, except for a moderately good year in 1995, the rainfall has been below average. The International Fund for Agricultural Development (IFAD), in approving funding to support the National Programme for Rangeland Rehabilitation and Development, referred to this as the ‘worst drought in decades’ (IFAD ). There is, however, no evidence for climate change effects in Jordan. This contrasts with other nearby regions, for example, the Sahel of North Africa, where desertification has been associated with both increasing livestock numbers and decreasing rainfall (Hiernaux ). Rainfall at Wadi Dhuleil (NE of Amman) and Azraq, plotted against the 30-year mean (BRDC 2005, Meteorological Department). Another notable reason for the decrease in the daily average grazing time, mentioned by 89 % of the study participants, is the prohibition of transboundary grazing, as we have already noted. When asked about how grazing was managed in the past to ensure sustainable rangeland regeneration, 90 % answered that they grazed across borders and boundaries. This practice was a natural (hima-like) protection and graze management system where herders moved from place to place based on a collective understanding of where not to graze each year. Today, however, such a system no longer exists, according to the participants in the study. Unfortunately also, 26 % of the participating herders who do not rely on the rangeland for grazing, but whose sheep are nonetheless physically present on the range, admit that they allow the practice of early grazing. Their sheep immediately destroy all plants as soon as they start to grow. Such early grazing interrupts the natural life cycle of plants and the plants are soon no longer able to replenish and reproduce. In the past, due to a plentitude of rangeland and plant diversity, both the quality and quantity of milk was significantly better than present day, according to the Badu interviewees. Despite this, it was considered by the Badu to be shameful to sell milk produced by their animals, leading them to use it only for household consumption and for sharing with neighbours and guests. Today, the Badu sell the milk produced by their flocks in order to pay for livestock feed. This is very much an indicator and result of social change. Due to the need to pay for feed, traditional customs are disappearing and what the Badu previously saw as shameful is now a financial necessity. When asked about their milk yield, all participants agreed that sheep are producing less milk these days due to insufficient land and foliage available for grazing, or a lack of plant diversity, or some combination of both. The participants stated that without plant diversity in the diet of sheep, milk quality goes down, and the dependency on concentrated feed containing only barley and wheat bran results in poor quality milk. Since sheep have evolved to eat grass, barley and wheat are unnatural foods that lead to a decrease in milk quality and production, and a decline in the overall health of the animals (Campbell and Roe ). Table 1 shows various nutritional and medical problems that the participants have seen in their livestock over the past 50 years. Sixty-nine percent of respondents stated that their animals suffered from health problems at some point in the 50-year period. The most frequent health issues were pox and mastitis, both at 57.5 %, and external parasites at 39 %. Other health problems reported by respondents included bloating and foot and mouth disease (FMD), both at 29 %.d Currently, the Badu are seeing many diseases that were not common or did not exist in the past. Examples are enterotoxaemia, wool and hair loss, respiratory infection and diarrhea. With regard to treatment, the participants responded that a limited number of plant species were used in the past. Eleven percent of participants used Artemisia judaica L (Ibeithran, in Arabic) to treat animal health conditions, and Artemisia herba-alba (Shieh) and Achillea fragrantissima (Gaisoom) were also mentioned, both at less than 5 %. In most cases, the animals either healed naturally or died without any treatment, taking into consideration that animal diseases in the past were significantly less frequent than now, as the animals were generally in better health due to increased mobility and a diet that included a wide range of fresh plants. Today, the animals are presenting different types of ailments than in the past. These ailments are generally treated with new chemical-based, rather than plant-based, medicines, either because pharmaceuticals are known to cure the ailments quickly, or because the Badu have not seen these ailments before and therefore do not know what plants to treat them with. Table 2 lists the main plant species of the badia considered to be endangered by the study participants. Several of these species flourished in the past but can no longer be found in the region, and many more are thought to be endangered. A large percentage of participants responded that Artemisia herba-alba (Shieh) (71 %), Achillea fragrantissima (Gaisoom) (74 %), and Salsola vermiculata (Rotha) (76 %) could be found in the past and are no longer available, or have not been seen in recent times, and are thus considered to be endangered. All of these plants are very important for the Badu and their livestock. The majority are palatable for people and animals and some are even used for medicinal purposes, making them vital resources. The strong assumption that these plants are endangered is a negative effect on the lives and health of the Badu people and their livestock. To determine local knowledge about the plant species, the participants were asked how they use the plants in their area. Forty-three percent of respondents said Salsola vermiculata (Rotha) is a palatable plant, 42 % said Achillea fragrantissima (Gaisoom) is both a medicinal and palatable plant, and 51 % said Artemisia herba-alba (Shieh) is both a medicinal and palatable plant. Table 3 provides more information on plants used to treat people in the badia. An overwhelming 90 % of respondents reported using Artemisia herba-alba (Shieh) for health problems including gastrointestinal trouble (64 %), respiratory health (6 %), general pain (1 %), and wounds and other injuries (1 %). In scientific research, it has been mentioned that A. herba-alba (Shieh) is used as a hypoglycaemic, and an antioxidant (Iriadam et al. ). When asked about how plants are prepared for medicinal purposes, 70 % of respondents said that for gastrointestinal and respiratory problems, they boil A. herba-alba (Shieh) in water and then drink. A large percentage (85 %) of respondents also stated they have used Achillea fragrantissima (Gaisoom) for gastrointestinal (63 %), respiratory problems (5 %), and general pain (1 %). Artemisia judaica L (Ibeithran) is also used for gastrointestinal trouble by 42.5 % of respondents, by boiling in water and drinking. In scientific research, it has been mentioned that A. judaica L (Ibeithran) is used as an antioxidant, a molluscicidal and an anthelmintic (Liu et al. ; Abdelgaleil et al. ). Another medicinal plant used for treating gastrointestinal problems is Achillea santolina L. (Gaisoom). Sixty-nine percent of respondents reported that they boiled this plant and drank the tea. Twenty-six percent of participants also used wild Thymus bovei (Zaatar barrie) for treating gastrointestinal and respiratory problems. Environmental and societal changes in Jordan in the last 50 years have had dramatic and detrimental effects on the rangeland, plant biodiversity, livestock and people of the badia. The free movement of Badu herders has been restricted by the closing of international borders and the expansion of built-up areas. Sheep flocks now mostly stay within specific rangeland areas year-round, and their constant presence is stressful on the environment. The sheep often eat the new shoots of young plants, hampering the regrowth of vegetation on the range. The loss of the nomadic lifestyle also marks the end of most hima practices that used to allow time for rangeland areas to regenerate, when flocks were away in other locations. The rangeland vegetation problem is further aggravated by a lack of water in the badia caused by recent droughts, less water flow from the north, and fewer people practicing natural water harvesting methods. Large flock sizes in the 1980s, coupled with decreasing availability of forage on the range, prompted government intervention in the form of subsidized feed, which kept flock sizes artificially high. The unrelenting pressure of large numbers of sheep on the range further degraded the range. When the government feed subsidy was suddenly withdrawn in 1996, production costs soared for livestock owners, prompting a cycle of selling off sheep to pay for feed purchases. In some cases, whole flocks have been decimated, leaving the former owners without a source of livelihood and dependent on government aid. With today’s rangeland now being largely insufficient to sustain current levels of sheep flocks, the 99 % of the study participants who are now totally dependent on manufactured feed are facing severe economic hardship. In addition to spending large sums on feed, they also have to shoulder the cost of daily trips to government wells to supply water for their flocks. The many changes in Jordan’s badia over the last 50 years have led to an unsustainable situation for the Bedouin communities and the environment. Urgent and immediate attention should be given to the Jordanian badia, to save the rangelands and biodiversity, preserve the pastoral lifestyle, and allow the Badu to live with dignity. Programmes should be introduced to spread new, simple technologies that could help the Badu increase their revenues from their flocks. These could include early fattening techniques, sheep estrogen cycle synchronization, and ram isolation. A detailed study should be conducted to investigate and evaluate the economic situation of the Badu as a result of all the recent changes in the badia and the livestock industry. Socioeconomic studies should be conducted with regard to any proposed changes in policies or decisions related to livestock and the ecosystem in the badia. A participatory approach should be encouraged, to actively involve the Badu in decision-making concerning the badia. A detailed study should investigate the badia’s medicinal plants and their uses. Awareness should be raised among the Badu, and especially the younger generation, about the importance of preserving traditional knowledge on medicinal plants, protecting the plants, and potentially profiting from them. aFocus groups (group interviews) were employed for their combination of the advantages of in-depth interviews and observation (Tashakkori and Teddlie 2009). They had the capacity to reveal participants’ attitudes and experiences, interactions among group members, shared knowledge and contrasting views. Extended focus groups were used during field trips where a greater emphasis was needed on observation and elicitation of knowledge in the context of the natural environment. bParticipant observation served to document the practices of local experts and interactions between them and their environment in the most natural context. The methods used, in the order followed, allowed us to progress toward an emic understanding of Local Knowledge. c55% were illiterate, while 30% had received primary education. dIt should be noted that the Ministry of Agriculture has a system called Koushan (under Law 42, Articles 14-17) that requires herders to show proof of vaccination against FMD, brucellosis, pox and Peste des petits ruminants (PPR) in order to buy feeds at the subsidized government-regulated price. In addition to the vaccination information, the Koushan booklet certifies the number and type of livestock owned by the holder, and feed quotas are calculated accordingly. from the University of Newcastle Upon Tyne, UK. He is a former Deputy President of the Badia Research and Development Center in Jordan. Dr. Al-Tabini has managed development projects in the Middle East and North Africa on community-based rangeland rehabilitation, management of scarce water resources, and sustainable livelihoods in agro-pastoral communities. He also collaborated in the set-up of the Badia Center for Ecological Educational. Dr. Al-Tabini is currently a researcher at the Royal Botanic Garden of Jordan, and the Academic Director of World Learning/SIT Study Abroad programmes in Jordan He has published 25 academic papers and reports in international journals and at international conferences. Khalid Al-Khalidi has extensive experience in socioeconomics. He was the project coordinator for community-based rangeland rehabilitation at the Badia Research and Development Centre before joining the Royal Botanic Garden in the same capacity in 2008. Al-Khalidi has published several papers and attended international conferences. Mustafa Al-Shudiefat has a degree in veterinary medicine and surgery, and experience in the field of the animal health and community development. He works at the Jordan Badia Research and Development Centre as a head of the local community development department and does research for the Royal Botanic Garden. We would like to express our gratitude to Her Royal Highness Princess Basma bint Ali, founder of the Royal Botanic Garden (RBG) of Jordan, for her encouragement and continued support and the Association Française de Développement and Fonds Français pour l’Environnement Mondial for funding the project. We also wish to thank RBG Executive Director Tariq Abutaleb, RBG Research Manager Dr. Oraib Nawash and all the participants in the study. Thanks also to Habiba Dingwall, Sarah Hayes and Barbara Gausewitz for their unforgettable support in editing and reading the paper. The authors declare that they have no competing interests. This work is done for research purposes and there are no outside interests or incentives that conflict with the study. RT provided the main features of the rangeland, grazing and feeding components as well as the design and conduct of the study. KK provided the parts concerning socioeconomic changes, and medicinal plant use and identification. He also contributed to the overall analysis and data gathering and entry. MS provided the parts concerning animal health issues and contributed to the overall analysis and data gathering and entry. The authors have read and approved the final manuscript.